Growth rates are a set of hidden stats that govern character growth in every Fire Emblem game. Each playable character has their own set of growth rates, with a growth rate value for each stat that can increase during a Level Up (eg. HP, Strength, Skill). This value is the percentage chance of that stat increasing by +1 during a Level Up (so a growth rate of 50 means there is a 50% or 1 in 2 chance). Once a character Levels Up, the game compares each of their growth rates with a Random Number (from 0 to 99). If the Random Number is less than the growth rate, then that stat will increase by +1, otherwise, it will remain the same. Since the Random Numbers will be different each time, the Level Up outcomes will generally be different. Sometimes, if the Random Numbers are all too high, the character will gain no stats during their Level Up – that’s just a sad fact of how Level Ups work in Fire Emblem. Tana Levels Up. Her HP, Speed and Luck growth rates are the highest, so they have the most chance of increasing. When it comes down to it, character growth in Fire Emblem is basically random and all down to chance, although there is restriction in the form of growth rates. There are no simple growth patterns to be followed like in many other RPGs. To prevent having terrible characters due to bad luck with Random Number rolling, some players may choose to reset the game when they receive a terrible Level Up (or many of them in a row). 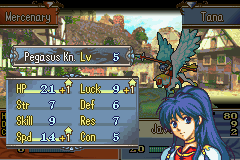 This is what it commonly means to “RNG-abuse” – in other words, the player doesn’t accept what the Random Number Generator has immediately provided and instead repeats the Level Ups until they get desirable ones (such as for making Wi-Fi squads in Shadow Dragon). Unlike playable characters, generic enemy or NPC characters don’t have their own growth rates. Instead, they use class growths to generate their stats. Generic enemy or NPC characters also don’t Level Up like playable characters do, but they do receive a series of hidden Level Ups at the beginning of the chapter – the number of which is proportional to their displayed Level. For such characters, class growths are the percentage chance (approximately) of increasing a stat by +1 during a hidden Level Up. It is for this reason that enemy stats usually vary slightly from time to time (eg. when you replay the chapter). In Shadow Dragon, there are two types of class growth rates – the above and player versions (which are used to calculate the effective growth rates, see later). Otherwise, class growth rates are only used by generic enemy or NPC units (and for calculating Hard Mode bonuses). If a character has a growth rate of 100 in a stat, unsurprisingly that stat will always increase by +1 during a Level Up. Except, of course, when the stat has reached its maximum value. Once the growth rate surpasses 100, 100 is subtracted from the growth rate value and is attributed to a guaranteed +1 to the stat during a Level Up. The remainder becomes the percentage chance of the stat increasing by +2 instead (so a growth rate of 120 has a 20% chance of a +2 and a 100% chance of a +1). If the growth rate is over 200, the same principle applies, except the character will always get at least +2 during a Level Up, with a chance to get a +3 instead. Without any complicated hacking, the highest growth rate possible is 255. This only features in Path of Radiance. In Fixed Mode (unlockable after beating the game at least once), character growth rates function in a different manner – this time they are treated as points, which accumulate with each battle. Once a character reaches 100 points in a stat, that stat will increase by +1 when they Level Up. After which, 100 points are deducted from that stat. Just like normally, stat increases of +2 and +3 are also possible. The character’s equipped weapon and accessory, as well as the type of enemy class they fight can alter the growth points that they receive (usually by +/- 5). The character’s own growth rates generally give the most points, so characters will tend to reach their “average stats” in this mode. For more information on Fixed Mode, please check this page. In Shadow Dragon, there are two sets of growth rates at play – the character’s personal growth rates and their class’s growth rates. It is the sum of these two growth rates – the effective growth rates – that are used to calculate stat increases during a Level Up. When a character reclasses or promotes, their effective growth rates will usually change slightly, since the class growth rates generally differ between classes. In all other games, the effective growth rates are equivalent to the character’s personal growth rates. This is true even for The Sacred Stones, so no matter which promotion branch you follow the character’s growth rates will be unchanged. These only appear in Shadow Dragon. Often, the effective growth rates for a character can be negative (such as Magic or Resistance growth for physical-based units). When a character Levels Up, stats with a negative growth rate won’t ever decrease since the game treats them as 0% growths exactly. Again, this is a phenomenon that only features in Shadow Dragon. The effective growth rates actually vary slightly depending on whether the stat increases or not during a Level Up, with the general effect of compensating for failed stat increases. Factoring in reclassing, this can lead to effective growth rates of 0 yielding a +1 stat increase during a Level Up. Meanwhile, as the dynamic growths build up, this can lead to growth rates lower than, but near, 100 of yielding a +2 stat increase during a Level up. For more information on Dynamic growths, please check this page.